Lenny Daws (pictured) and Ville Piispanen clash for the vacant EU jr welter title October 13 at a venue to be announced. Hennessy Sport will promote the event. Spaniard Joaquin Cespedes have vacated the EU superbantam title and the mandatory challenger, Frenchman Khedafi Djelkhir will take on the highest available contender for the vacant crown. As for Cespedes he will in the future campaign at featherweight. EU lightheavy champ Orial Kolaj will make a a voluntary defence of the title October 19 at a venue to be announced against Czech Tomas Adamek, who is not to be confused with the US-based Polish heavy. For the EU Lightweight vacant title between Edis Tatli and Paolo Gassani the parties reached an agreement. EBU featherweight king Alex Miskirtchian will defend the title against Oleg Yefimovich October 28 in Belgium with Alain Vanackere as promoter. It´s not official but German website figosport.de writes that Sauerland have signed up Danish amateur star Dennis Ceylan. Ceylan just participated in the London Olympics where he competed at bantam and lost in the first round. 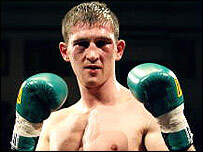 Sauerland previously signed up another London Olympian in Enrico Kolling. Glowacki won the vacant WBO I/C title. Romero was down in the seond and twice in the sixth before it was stopped. Luz won the vacant Mundo Hispano I/C title on scores of 100-88 on all cards. Guevara had two points deducted for various illegal stuff. De Jesus retired after the fifth, behind 50-54 on all card.